Sound "Intensity and thrust" -- "fundamental tones and harmonics of the piano are just right from the sweet Nautilus midrange, and the full, vibrant bass is superb; what's more, " the three drivers combine with seamless integration; but "they really are at their best when reproducing music at live levels and tend to lose a sense of life while playing background music." Features Nautilus technology, including "a tapered tube to lead energy away from the rear of a driver," "FST suspensionless midrange," "dimpled Flowport port," and an external crossover. Use "These speakers like power" -- John biamps with Krell and Ayre solid-state amps; he also recommends a room at least 12' x 16'. Value "Certainly competitive with all challengers anywhere near their $11,000 price." Lets cut to the chase: B&W's Nautilus 801s sound darn good. If youre in the market for an $11,000 USD pair of loudspeakers, you should listen to the Nautilus 801s. This is all old news. The current 801 design debuted in 1998 and has received several positive reviews. The speakers have been used as recording monitors and in various manufacturers product demonstrations, and they are respected by many audiophiles. Enough said? Good, lets go listen to music. Whoa! Just a minute. The issue isnt what someone else thinks, but whether the speakers would work well for you. Sorry partner, I cant tell you which speaker to buy, but I am prepared to describe my experience with the Nautilus 801s. Compromises exist, even at this level, so what are they? And how about associated component and room interactions? I can help shed a little light on these and other issues. The Nautilus 801s were delivered to my home in two large boxes, each seemingly within the same heavyweight division as a W.W.F. wrestler. Each speaker tips the scales at 229 pounds and measures approximately 44"H x 20"W x 27"D. The speakers come covered in plastic and encapsulated within Styrofoam cocoons that surround each fully assembled unit. Despite the excellent packaging, one speaker lost the battle and arrived damaged. The freight company apparently dropped it, resulting in a delaminated cabinet, a broken lower column, and one torn-up cardboard box. Matching front veneer links each pair, and consecutive serial numbers identify mates. Two new speakers, please. About a month later, a second pair showed up. I heard no significant difference in sound from the fresh replacements, so I assume the impact of "break-in" is minimal. (Ha!) Both new Nautilus 801s showed some minor cosmetic defects, a condition I considered irritating for a speaker in the Nautilus 801's price class. The wood was scuffed prior to application of the cabinet finish on one, and an abrasion occurred during shipment from a creased instruction tag to the other. 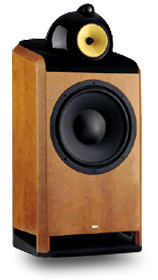 The Nautilus 801 follows B&W's tradition of a three-way loudspeaker with separate enclosures for each driver. Each module is far more curvaceous than that of the old Matrix series, apparently to reduce diffraction. The three drivers combine to give a claimed frequency response of 37Hz-20kHz +/- 2dB, -6dB at 23Hz. Stated sensitivity is 91dB/W/m, with an 8-ohm impedance. B&W went to great lengths to isolate each enclosure from the others, including the use of IsoPath, a liquid suspended in a polymer base. The bass unit contains a 15" paper/Kevlar woofer vented downward through a dimpled Flowport port onto a tapered base. The well-braced, elliptically backed wooden cabinet easily passes the knuckle-rap test and is available in black ash, cherrywood and red-stained cherrywood veneers. The cast metallic speaker base holds the crossover (crossover points are 350Hz and 4kHz), two pair of speaker terminals, and mountings for either casters or spikes. Research during the Nautilus loudspeaker project found the importance of a tapered tube to lead energy away from the rear of a driver. This technology is visually evident on the midrange and tweeter sections of the Nautilus 801. The 6" woven Kevlar FST suspensionless midrange is housed in a sleek, high-gloss black shell constructed of Marlan, a synthetic resin. Located above the midrange is the tweeter section, which consists of a 1" aluminum-dome tweeter mounted in a structure resembling a large microphone. A friends wife even exclaimed, "Oh look, they even come with microphones!" and made her move to sing karaoke with the tweeter. I almost pulled a hamstring lunging to keep her from decapitating the speaker. B&W obviously spent lots of effort and money developing the Nautilus loudspeaker technology, followed with the Nautilus 801s design, and then trickled lessons learned down to the rest of the Nautilus line. If youre interested, B&W offers an excellent, fifty-page booklet entitled Development of the Nautilus 801 Loudspeaker, which details all of the technology -- and includes pictures, schematics, and measurements. This publication is available for download at B&W's website. In all, the Nautilus 801s are a distinctive design and certainly dont look like a pair of plain, rectangular boxes. The Nautilus 801s can move a lot of air and require a decent-sized room. Considering all of the work spent on minimizing speaker reflections, confining the Nautilus 801s to a small or crowded room makes no sense. Personally, Id look elsewhere if my room were smaller than 12' x 16'. B&W recommends a minimum of 6.5' between speakers and at least a 1.5' distance from the side walls. I placed the speakers about eight feet apart, nine feet from the listening position, about two feet away from the front wall, and toed them in just a hair. The Nautilus 801s dont seem to require a location six or eight feet into a room to sound good, and their bass response strengthens when the speakers are positioned closer to the front wall. These speakers like power. Ive heard them perform well in showrooms when driven by a Krell FPB-600, a pair of Mark Levinson 33H monoblocks, and biamped with a pair of Levinson No.335 amps. My old Krell KSA-150 did an OK job powering the Nautilus 801s, but the mids and highs lacked the refinement of which the speaker is capable. While auditioning new amplifiers, an Ayre V-1 just did not show enough control or slam on the bottom end, but I loved the amp everywhere else. The Krell and Ayre amps seemed to have very similar input sensitivity and voltage gain, so Ive decided to play mad scientist and biamp the Nautilus 801s with the Ayre V-1 on the top and the Krell KSA-150 on the bottom -- with very good results. Some people claim they cant hear any audible differences in cables. Maybe they should listen through the Nautilus 801s. Cardas Neutral Reference speaker cables sound super smooth in the mids, but a tad rolled at the frequency extremes. Kimber Bi-Focal XL was likely the most uncolored-sounding speaker cable, and almost a complete opposite to the Cardas. It showed plenty of bass and sparkle, but a slightly recessed midrange too. AudioQuest and Synergistic Research cables ultimately proved to be the most balanced in my system. I liked the midrange bloom from the Synergistic and used the Resolution Reference for the midrange/tweeter and Signature #2 for the bottom end. The rest of my system consists of a PS Audio Lambda CD transport feeding bits through an Illuminations D-60 coaxial digital interconnect to either a Dodson Audio DA-217 Mk II D or a Theta DS Pro Basic IIIa digital processor. A Melos SHA Gold preamplifier, used in passive mode, routes signals to the amps through AudioQuest Diamond and Opal interconnects. An API Power Wedge 116 conditions AC power to the front-end. Whats the first thing you hear from live music and dont hear at home? For me, live music is louder and always much more dynamic. Yeah, rock concerts have their racks of amplifiers and literally walls of loudspeakers, but even unamplified instruments in a jazz club have much more sting than you normally hear from a stereo system. Listen to Toni Braxtons Secrets [LaFace 73008-26020-2], "Un-Break My Heart" in particular. At the start, Braxtons sultry voice originates from center-stage with presence and each inflection clearly communicated. The bass line seems to have no discernible source, but it has power I can sense in my body more than actually hear. No big deal, really. But when the climax starts at about the three-minute mark, I feel pinned to my seat by the intensity and thrust from the speakers. Braxton's voice retains its placement and size as the energy builds around it. Then the background vocals hit, and I'm submerged in a sea of sound and unable to escape. Wow! Other songs from this disc demonstrate just how punchy and controlled bass can be, assuming the amp is up to the task. But a better reference CD for bass is Marian McPartlands Hickory House Trio - Reprise [Concord Jazz CCD-4853-2]. When Joe Morello smacks his drum skins, the impact is startling through the Nautilus 801s, and the drums simply sound more like the real thing. In addition, the fundamental tones and harmonics of the piano are just right from the sweet Nautilus midrange and the full, vibrant bass is superb. Im amazed at how these speakers can, at the same time, reproduce shattering dynamic contrasts and pure timbre. If thats not an amazing enough feat, the three drivers combine with seamless integration. The music is portrayed in a three-dimensional space extending well past the speakers and never appears to emerge directly from an individual driver or either channel. The Nautilus 801s can play very loud and amazingly clean when driven hard. They really are at their best when reproducing music at live levels and tend to lose a sense of life while playing background music. And power is addicting. At times, I fear for my hearing when I reach old age. On numerous occasions, Ive been "in the zone" while listening -- the one where everything sounds right and youre transported to a different place and time. Sometimes my wife will walk into the room, her lips are moving and she is obviously shouting, but I cant hear a word. So they can play loud. If you want just ear-splitting noise, youd shoot off a gun, right? Well, the Nautilus 801s are also both highly musical and quite revealing. I love when one of my old favorites gets remastered, and I just picked up George Bensons Breezin [Warner Archives/Rhino R2 76713]. Bensons guitar play and the string tracks are smooth as silk, and are attractively offset by the driving percussion. Vocals are a special treat through the 801 -- full of body but never lean or bloated. Subtle details like breath or light modulations highlight the performance and serve to provide realism. But components capable of reproducing minute details can be a double-edged sword -- great recordings are represented near their full potential, while bad recordings sound, well, bad. Through the Nautilus 801s, most of my music collection is enjoyable, and I discover hidden treasures almost every time I spin a disc. Just dont expect a turd to smell like a rose with the Nautilus 801s, because it aint gonna happen. Any deficiencies will be exposed, and any recording with limited dynamic range takes away one of the major strengths of the Nautilus 801. One example of a horrible recording is "Layla" from Derek and the Dominos Layla and Other Assorted Love Songs [Polydor 31453 1820-2]. Claptons compressed vocals sound as if they were miked in a toilet bowl across the hall from the studio. In addition, almost every articulation peaks with grating clipping noises. As much as I like this tune and the rest of the music on this disc, I prefer to hear it from my PC speakers, as its virtually unlistenable through the Nautilus 801s. The Nautilus 801s are capable of throwing a big, deep soundfield much more limited by the room and the recording than by the speakers themselves, and they absolutely excel at precise imaging. When youre blessed with a recording holding ambient cues, the harmonics blend to define the boundaries and space. Meanwhile, the individual instruments remain perfectly stable and located on the mark. Imaging performance improves further with removal of the midrange and bass grilles. The Art Pepper Quintets recording entitled Smack Up [Analogue Productions CAPJ 012] is a typical early-'60s stereo affair with left-center-right instrument placement. Peppers sax barks forth from center-stage with a reedy, full tone. The piano and trumpet come strictly out of the left channel, while the bass and drums are confined to the right. Each contributor doesnt vary in location by an inch, whether playing solo or as part of the entire quintet. Only the cymbals splash slightly toward right-center. I like this disc, but better recordings go much further toward re-creating realism (like the McPartland CD). So is the B&W Nautilus 801 the perfect loudspeaker? Nope, Ive heard larger systems present a bigger soundstage. Planar speakers designed to emit energy from both sides tend to portray a deeper soundfield. Other full-range speakers and subwoofers can go lower in the bass. Ive even been seduced by the luscious, more-forward midrange of the Hales Transcendence series. But what the Nautilus 801s do, they do exceptionally well. And this is what makes them a true high-end product. Prior to hearing the Nautilus 801s, I owned a pair of B&W 801 Matrix Series 2 speakers with a Van Alstine crossover modification. I owned and enjoyed these speakers for over eight years. The move from Matrix to Nautilus was much more of a revelation than a refinement, although both share common objectives. The distinctive tone of a trumpet or piano still shines through, just with more detail and energy. The Nautilus will play much louder and with less distortion. At times, the bass from the Matrix could sound a bit boomy, where the Nautilus 801's bass is both more controlled and dynamic. Significant progress was also made in the tweeter section. With the Nautilus 801s, cymbals can ring true with spectacular shimmering and less hardness. All of the research and development provides much-improved imaging. To assign a value, I consider a pair of the 801 Matrix series to be a reasonable value at $2000-$3000 on the used market. In contrast, the Nautilus 801 is certainly competitive with all challengers anywhere near their $11,000 price. It can be a frustrating goal to re-create small-group jazz in my living room. The concept seems simple enough, yet Im not even close. A number of things need to progress. Unfortunately, often the largest deficiencies come from the recording process. All this said, the B&W Nautilus 801 speakers bring me closer to my dream. They combine a level of full-range dynamics, musicality with detail, and pinpoint imaging within a reasonably sized package, all of which is unsurpassed in my experience. If your sonic priorities align with mine, go listen to a pair. Just be prepared to pay the price for clean, big power, fine associated components, and a reasonably large room. Every link in the chain matters, and the Nautilus 801 will rarely be the weakest link. Price: $11,000 USD per pair.